Mary Shelley’s Frankenstein is an enduring masterpiece of gothic horror, a tale of one man’s desire to create life and his monster’s struggle to understand and fit into society. The tragic tale has now been given a brand new adaptation by Blackeyed Theatre, described as one of the most innovative and audacious companies working in contemporary English theatre. So strap yourself in for a thrilling and emotional ride – you might think you’re familiar with the story of Frankenstein, but you haven’t seen Blackeyed do it yet! This new adaptation of the tale of Faust tale is set to be a riot! In this 1920s-inspired version, Faust battles the devil for his soul set against a backdrop of gangsters and bootlegging. Plus, it’s all to the sound of the best jazz standards, as well as incredible bursts of Lindyhop, Charleston and swing! 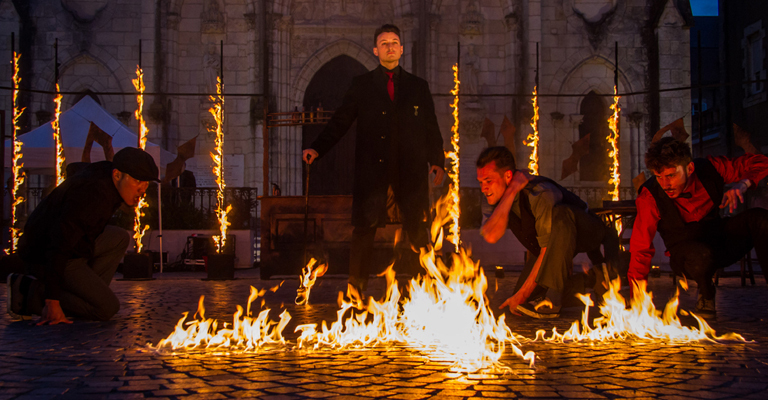 The location of the performance is a secret (be prepare to be blindfolded on the way to the set) and it’ll be literally set on fire in a spectacular display that you’ll never forget. This tale might be centuries old, but it’s getting an explosive makeover here. When you’re a child, you just want to be like the adults. Molly is no different, so her mum makes her a moustache. While she’s wearing it, Molly can go everywhere and do anything she wants, but she quickly begins to learn that being an adult isn’t all it’s cracked up to be. Molly’s Marvellous Moustache features some great original music and is a barrel of laughs, and lives up to the reputation of the original storybook gloriously. It’s been 34 years since ABC released their landmark album The Lexicon of Love, and this year saw the band release the (very) long awaited direct sequel, The Lexicon of Love II. This special tour sees Martin Fry and his bandmates taking both albums on tour – they’ll be performing their 80s classic in full while also playing tunes from the new album as well as a handful of their other hits. It’s a great opportunity to see one of the country’s best loved synthpop bands revisit some of their finest moments. It’s the basis of all comedy: the killer punchline. But why do some punchlines fall flat while others are in danger of giving the audience stitches? Well, none of those answers will be answered here, but you might get to understand why that chicken actually crossed the road. Maybe. As part of the Newcastle Alternative comedy festival taking place at The Stand, Matt Reed and others host a panel show dedicated to the gag. The only thing you’ll be gagging on is laughter, though!